The Town of Lysander was established by statute in 1794 and is in the Northwest corner of Onondaga County. It is bordered on the North by Oswego County, on the West by Cayuga County, on the East by the Town of Clay and on the South, by the Town of Van Buren. It encompasses a portion of the Village of Baldwinsville and is surrounded by the Seneca River on the South and west and the Oswego River on the East. A suburb of Syracuse, Lysander is easily accessible from Route 690 and Route 481. Included within the Town is Radisson, a planned unit development. The Town is fortunate to have located within Baldwinsville a very active Chamber of Commerce. Children within the Town will attend the public school districts of Baldwinsville, Phoenix, Jordan-Elbridge or Cato-Meridian. Police coverage is provided by the Village of Baldwinsville Police, Onondaga County Sheriff's Department and by the New York State Police. 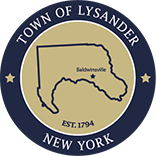 Lysander is governed by a Town Board, comprised of the Town Supervisor and four Councilors elected at-large. Town Board meetings are held the second and fourth Monday of each month and are open to the public. The Town Hall is located at 8220 Loop Road, Baldwinsville, NY 13027, and is open for general business from 9 a.m. to 4:30 p.m., Monday through Friday. Please feel free to call us at 315-638-4264 if you have any questions regarding town government operations.